Book reviewer Jaime Chambers with Ruled By Books has named me — thanks to Finders Keepers — one his top three comedy authors of all time, including best-selling Douglas Adams and Christopher Moore. Read here for more. In the mean time, if you want to learn more about Finders Keepers, check out these character illustrations that expand on the novel … including juicy background details about the characters themselves. Enjoy! Q: I keep hearing that FINDERS KEEPERS is a hilarious sci-fi buddy comedy. But what’s it about? 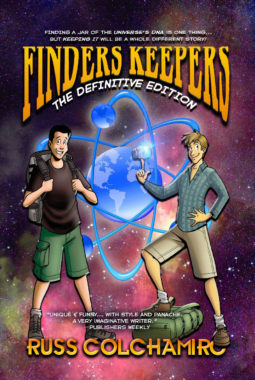 A: FINDERS KEEPERS is loosely based on backpacking trips I took through Europe and New Zealand, set against the quest for a jar that contains the Universe’s DNA. You know, a nice family drama. Ha! Q: Does Finders Keepers compare to anything else? A: If you like books, TV shows and movies like Hitchhikers Guide to the Galaxy, Quantum Leap, Time Bandits, Eureka, Northern Exposure, Scrubs, Harold and Kumar go to White Castle, Hot Tub Time Machine and Scott Pilgrim vs. the World, and authors such as Terry Pratchett, Christopher Moore and Tom Robbins, then Finders Keepers is for you. On a backpacking trip through Europe, Jason Medley and Theo Barnes stumble through hash bars and hangovers; religious zealots and stalkers; food poisoning and thunderstorms; cute girls, overnight trains, fever-pitch hallucinations–and the spectre of adult responsibility! 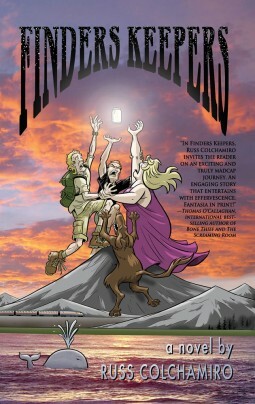 But when a jar containing the Universe’s DNA falls from the land of Eternity to the caverns of New Zealand, these new friends find their loyalties put to the test—unaware that a motley crew from another realm is chasing them across the globe, with the fate of the Milky Way hanging in the balance. You can also read some sample chapters to discover how this zany cast of characters came to be and find out about the publisher — 3 Finger Prints. FINDERS KEEPERS is a buddy story at heart, so its main thrust is the relationship between the two main characters, Jason Medley and Theo Karnes, two guys, both in their early 20s, but from opposite parts of the globe–the New York city suburbs and Auckland, New Zealand–and with very different attitudes about their places in the world and what the future might hold in store for them. From the very beginning I decided that I was going to write FINDERS KEEPERS in a way that was fun for me, and trust that the fun would translate to the page, regardless of what conventional storytelling might dictate. There’s 85 chapters, but they’re really short, which keeps things moving along; I use flashbacks throughout; switch between present day Earth as we know it, and Eternity (as I’ve decided it); and swap back and forth between characters. Some of what happens in FINDERS KEEPERS is a loose retelling of the places I went and people I met. Others are complete fabrications. And the scenes in Eternity … well, you can decide for yourself if you think that’s what’s really going on up there. And even though I wrote FINDERS KEEPERS as a goofy adventure, with some fantastical moments and a little bit of light sci-fi, to me it’s about figuring out what–and who–is most important to you, and what you will do to honor that. FINDERS KEEPERS was always meant to be a novel that took some chances. It was meant to explore both the big questions about life and the little ones, and most of all, be a lot of fun. I had a great time with it. I hope you do to.